Little girl seated on a cubic block, holding a small bag in her right hand. The girl wears a short-sleeved chiton. Her long hair is curled at the sides and is braided on top leading to a knot at the crown of her head. A large, almost square vent hole takes up most of the back side of the block. 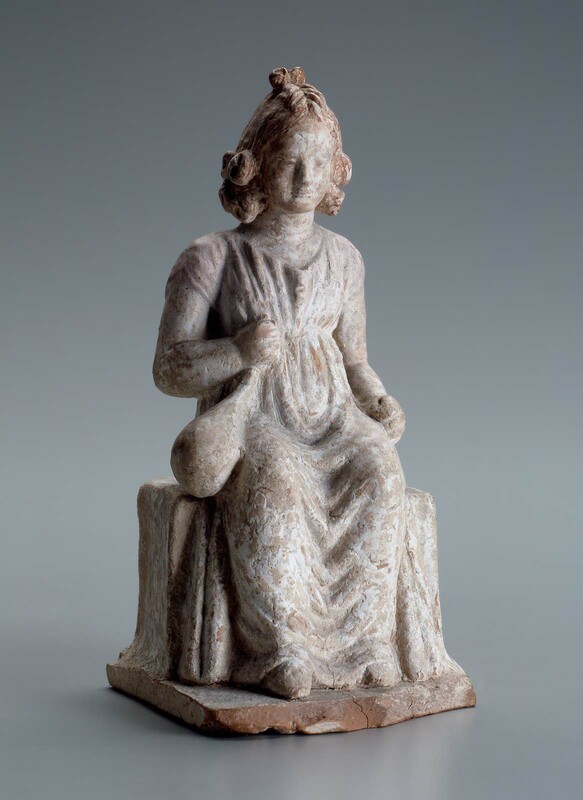 Red-brown color is preserved on hair and bag, brown on eyes, red on lips, pink preserved on shoulders of chiton; traces of pink on chiton; white base layer well preserved over most of composition; gray-black on seat. The front of the plinth is broken off. The figure was fastened to a flat base plate before firing. Almost certain that the bag she carries in her right hand contains knucklebones. Children are often depicted clutching a sack filled with their knucklebones. Her hairstyle is known as the lampadion, or “little torch,” because the piles resemble the flames of a torch.